Shop for authentic replica Culpepper flags. Our Culpepper flags are constructed of durable nylon with a canvas heading and offered in five sizes. The Culpepper Flag is a striking historical and local statement of identity. It belongs to Culpepper, Virginia, and is white with simple, black designs and phrases. The main emblem of the flag is a curled rattlesnake with its fangs and tongue showing it is ready to strike. Above, to either side and below this snake are clear statements relating to the snake's posture. 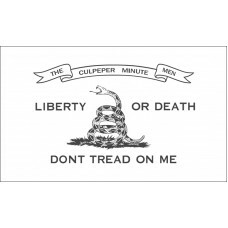 Directly above the rattlesnake's head is a banner with the words "The Culpepper Minute Men." To the left and right of the snake is the phrase "Liberty or Death." Underneath are the words "Don't Tread on Me." The symbolism and words embodied on the Culpepper Flag are designed to be provocative. They date back to the American Revolution of the 1770s. Culpepper became one of the first areas of North America to organize its own militia to fight the British during the Revolutionary War. With neighboring Fauquier and Orange counties, the Culpepper Minutemen were created by the 3rd Virginia Convention in July 1775. The term "Minutemen" refers to the speed with which the militia could mobilize and fight. There were Minutemen militias throughout the original 13 colonies of the nascent United States of America. The coiled snake emblem on the Culpepper flag was also adopted by other Minutemen groups, including that in Rhode Island. It is a visual warning to those who would try to occupy the militia's territory. As the British were attempting to land ships across the Eastern Seaboard, the rattlesnake served as a recognizable challenge to their forces. The phrase "Liberty or Death" is attributed to Patrick Henry. He had voiced the sentiment at the 2nd Virginia Convention in March of 1775. Patrick Henry was a famous attorney, orator and planter from Virginia who played a major part in the state's contribution to the Revolutionary War. At the Convention, he is famously said to have declared "give me liberty or give me death." The Culpepper flag was first flown in anger at Hampton, Virginia in October 1775. The Minutemen were deployed to attack British ships attempting to land there. They successfully repelled these attempts. Their training as extremely accurate rifle marksmen meant they were able to shoot British sailors through the gaps around their cannons. Probably the most famous victory for the Culpepper Minutemen was at the Battle of Great Bridge two months later. By this time, enemy forces had heard of the Culpepper militia's capabilities, and their mere presence gave them an edge in battle. Great Bridge was a massive victory for the Americans. The then British Royal Governor, Lord Dunmore, fled Virginia. For a group of home grown and trained soldiers, to expel a colonial occupier in this way was a remarkable achievement. 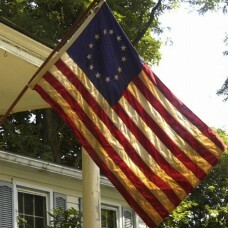 It is part of the reason local people treasure the Culpepper flag, and why it is extremely popular with collectors. Virginia played a vital part in expelling the British from North America, and the Culpepper Minutemen are legendary in the state.